So, all of my posts from Adventure Week have been posted, many with pictures! I’m back and settled in Lira for now. Things at work are unfortunately right where I left them – with nothing to do. The passed week was a really busy whirlwind, but I really enjoyed it despite several parts of it going wrong. All told, I spent 7 days in 5 cities in 2 countries. I spent way more money than I anticipated and the trip lasted moved one or two days later than it meant to. I also got to meet up with all three of my friends in Kampala, got to meet Jacob and see the IC office in Gulu, visited two genocide memorials in Kigali, hung out with Alison in two cities, met a group of cool Americans, saw fireworks. I also rode in two company cars, one private hire taxi, four buses, about a dozen matatus and two dozen bodas, along with two dugout canoes and a speedboat. I spent four nights in hotels, two on buses, and one in a friend’s room. For the visually inclined, here’s a map of my travel! As a caption I decided to sum up my trip via links to older blog posts, which is completely unnecessary. This is much more for me to put things in order, but you can enjoy the map if you’d like! A ( behind the H) – Lira town, Uganda. Started Adventure Week with a ride in the ACF car with Maxwell. B – Gulu town, Uganda. Hung out in a cafe and met Jacob the first night, and visited the IC office and had lunch with Alison. C (behind the G) – Kampala, Uganda. Literally sat in a bus station for three hours, and then was off again. 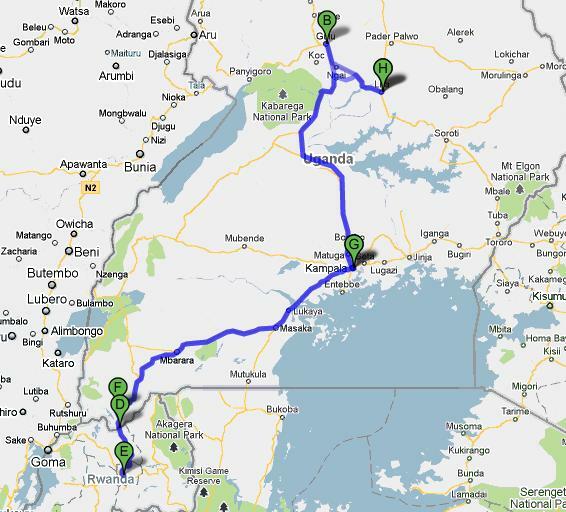 D – Katuna, Kabale District, Uganda & Gatuna, Rwanda. Spent a long time going through immigration. E – Kigali, Rwanda. The first day was mostly going to banks and checking into a hotel. The second day was a national holiday, but the third I turned into an intense memorial day. F – Lake Bunyonyi & Kabale town, Kabale district, Uganda. After a boda-bus-boda-speedboat connection, I spent a day at Lake Bunyonyi canoeing and lounging about. G – Kampala, Uganda. Spent a little over 24 hours in the capital meeting friends and celebrating the 4th of July.